So when is a color not a color??? 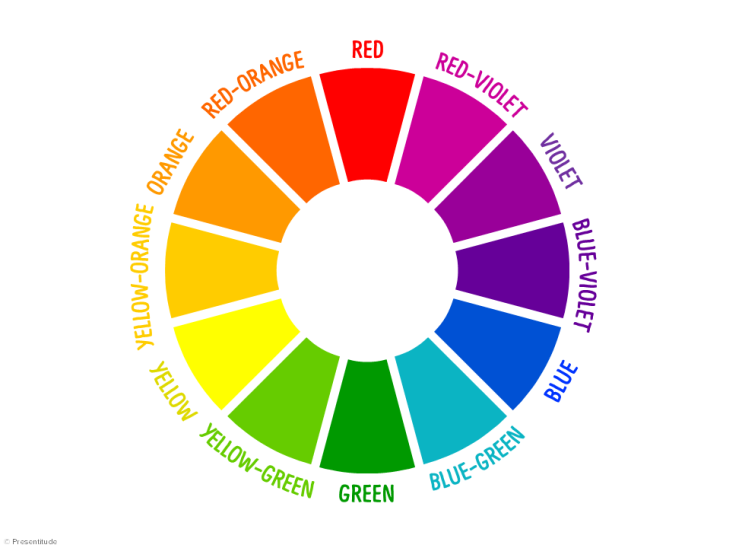 A proper color wheel looks like this… it has12 hue families. So no, we were taught incorrectly in school about R O Y G B I V– the so-called seven colors of the “rainbow.” No, there are actually 12 color families. Some colors on some versions of color wheels get left out. (like poor blue-violet) This one above is accurate. There are 3 “purples.” (I don’t like that word) For me, three sub-divided violets are a better way to think of them, and yes, they are all different from each other. Yellow-Green is a very different animal from “True” green. Yellow-Green is yellow-based, and True-Green is blue-based. Red-Orange tends can get left out too. Which to me is weird. We think in terms of “orange” or “red” as all-encompassing terms, but Orange-Red is a separate color from Red or Orange. This scale below shows how these hues transition, and although people tend to think of red as a “hot” color or as a very “warm temperature,” what you are typically observing is really Orange-Red… in the middle below. True Red actually starts to lose its “warmness” when it loses its yellow base, and so it starts to become cool. So take a good look below- is this a “red” car or an “orange-red” car??? But I digress…. 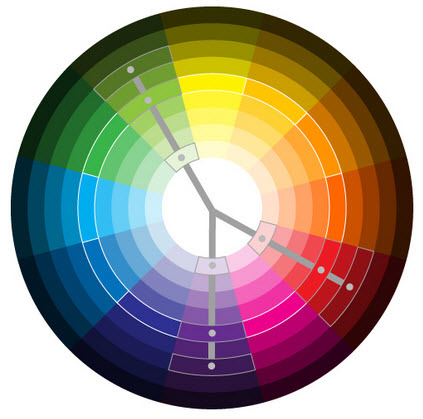 “Grey” or “brown” are only LOW-CHROMA versions of every color on the wheel. Low-Chroma can be thought of as the “dirtiest” or most desaturated version of a color. 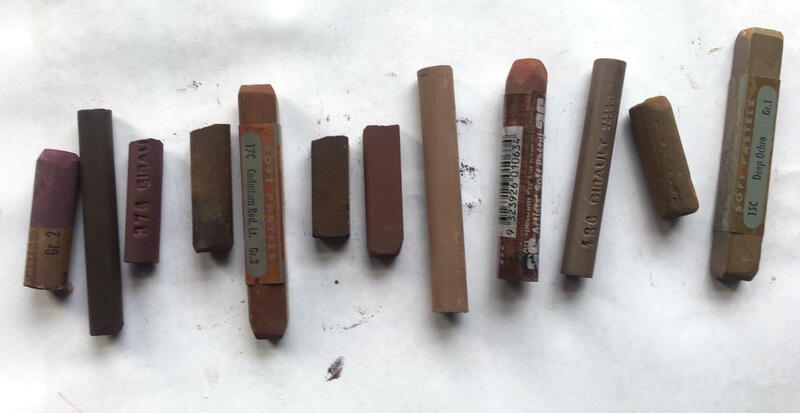 “Browns” are only those dirty versions of one of the 12 colors. Mostly when you grab or mix a brown, it will fall into one of the orange families. 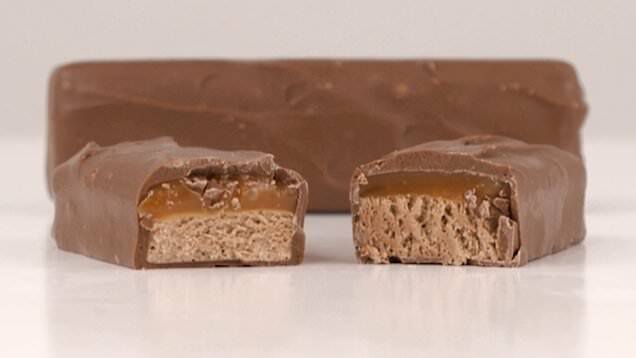 A chocolate bar? 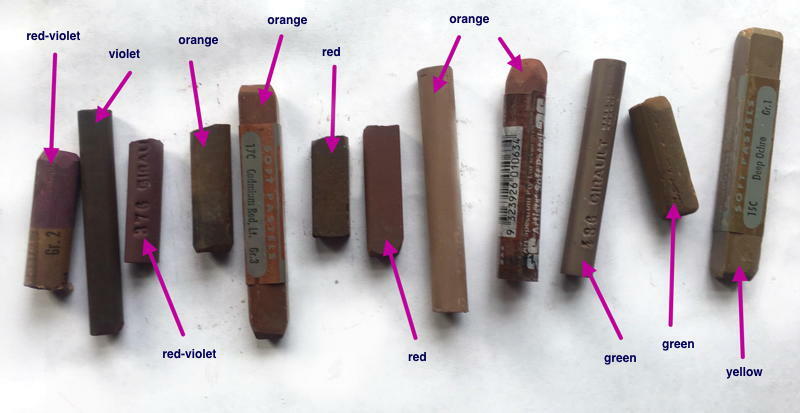 At its heart, it is orange… look again at the candy bar pic above… Again, good to know when putting a particular “brown” mixture against other colors in a painting because that orange will “speak” and affect the other colors around it…. For me, it is cool to be able to start to see INTO color. I bet in this lineup above it is easier to discern the colors than the “grey” sticks from last week. This may be a good way to see it below too… and those outside edges of “brown” will have different personalities based on its parent hue family. If you feel tired after reading this, I understand. Color is complex. It is a brain-bender and it is worth studying. I think I need to teach a class not only on color harmonies and how they work, which I have done several times, but also on the dynamics of color and color shifts and color “sensitivity”… who would be interested in that??? Until next week… I hope until then you look at your brown sticks in a new way. …give me time. Too busy to Say WHAT? Love your blogs (is your daughter your editor? ha- no- she is too busy for me….. I would be interested in an in depth color workshop. I haven’t thought of colors in the same way since I took your workshop. wonderful! I have taught color harmony and why it works, but this would be a bit different…I think I will be teaching new classes on color and composition in the near future at Sweetwater Center for the Arts. I am heading up a new Education Committee on the Board there and we are reviewing and thinking about new top-notch instructors and new types of classes. So if anyone in the Pittsburgh area has a wish to teach in Sewickley, reach out to me and let me know. Or, if you would like to see a particular type of class, I would be happy to hear about it…. Complex is an understatement, but its been fun. You are forcing me to look at color a different way. For a long time, I’ve worked with the knowledge that all colors have a warm and cool side. And may change as you progress into the painting. Exciting stuff. But just recently, I was asked to review some Terry Ludwigs I purchased. I was able to give a good one including the “leanings”. I never thought about color like that before. Thank you for that.